I have given up chocolate for Lent, and so it is in great anticipation of Easter that I suggest this Monday treat. 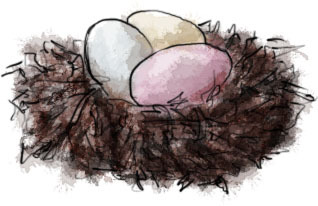 These nests also happen to be perfect if you find yourself needing to entertain children while, to pick a random example, their mother goes to have her roots touched up for the afternoon in a salon in Soho. For four hours. This is the same recipe that my Mum used to entertain my sister and I when we were children – as essential a ritual as lining up the fluffy chicks and rabbits on the window sills and hanging wooden eggs on a vase full of blossoming branches to make an Easter tree. We made them for cake sales at the Methodist church, for Brownies coffee morning, to take to Grandma and Grandpa in Wigan (which was great because they inevitably gave us their mini eggs). I think the key to getting a nest-like “nest” is using shredded wheat. Sure, rice krispies and cornflakes and cheereos (all delicious) might be handier, but do birds make nests out of things in nature that are shaped like branded cereals? No they do not. Shredded wheat resembles twigs and stems so uncannily when mixed around in chocolate. Were they specifically designed with chocolate nest cakes in mind? I like to fill my nests with Cadbury’s mini eggs because they are so beautiful. I’m also rather partial to a robin’s egg (kind of like a giant Malteaser), but obviously, use what you like. This entry was posted in This Dinner Will Get You Laid and tagged chocolate, Easter, Easter Eggs, egg, holiday, treat. Bookmark the permalink. Them with me and loved it! They turned out so cute! I’m really glad you enjoyed making them! I made these on Sunday………………but with cornflakes! I adorned mine with mini eggs and fluffy little chickens. Part of a cake sale at work – went down a treat. Hope all’s well. Still loving the blog. Thank you. Aw, fluffy chicks! Lovely!